The Ware for March 2018 is shown below. Thanks to Charl for contributing this ware! Fuso is a truck manufacturer. Two large pots on the first board, adjusted from the other side. There are two trim pots labeled temp and speed on the 2nd board. My guess is, that these are the guts of the heater/vent control of a Japanese car or truck. The Fuso label might suggest something from a truck. But those connectors are not what I think of as industrial, so if this belongs on a vehicle – something inside the passenger cabin, perhaps for the dashboard, rather than a more vibration prone environment. 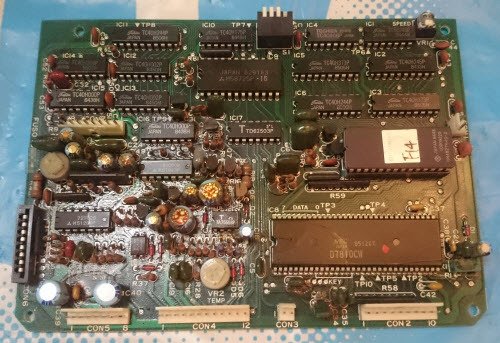 Is that 7810 microcontroller cracked, or is that just a layer of clear sealant coating the board? 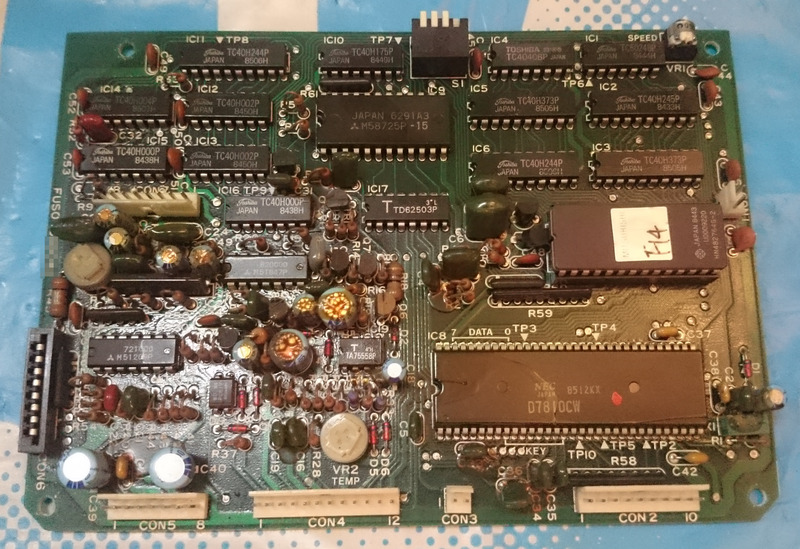 The bottom board could be largely replaced with a modern all in one microcontroller. VR1 labelled SPEED on the edge the board with DIP switches amuses me as it implies it is something that needs easy adjustment after assembly and installation. Speed of _what_? Nice puzzle. So many tunable coils lets me think of something oscillating. A special kind of receiver? Could also be a police siren controller. Or a professional mobile radio TRX. This smells like the dashboard of a mid-80s Mitsubishi. Temperature sensor at VR1, with the SPEED pot pointed out by gpshead. There’s an LED driver on the second board, but not enough segments to run the whole dashboard, so it’s an analog gauges. It might be from a Pajero, I’d guess 1986 year model. I can’t find one with a thermometer in that year, though (the later Monteros have them). The first board has some thick red leads coming from what looks like a multi-stacked pot. Three pins on the PCB for LV measurement/value display and two pins on the back for high voltage or power resistance. The destination of these wires is the top-right of the board, where a giant can with a hole in the top and two big heatsinked drivers live. Laser module? Maybe they made these for civil services? … alternatively that big round ‘laser’ module could be a connector or and inductor. The final two big heatsunk transistors are an RF push/pull stage and we’re looking at a traditional radio circuit. Coupled with the large amount of digital logic and speed sensors: some sort of remote reporting system? Vehicle speed and potentially position being constantly broadcast so you can tell if someone is speeding or stolen bits of your fleet. Full embedded would not have a dip-switch. Perhaps some kind of advanced thermostat including motor controller? Correction: it’s probably a transformer, given it’s silkscreen designation “T5”. Looks to be a radio transmitter for vehicle information. It seems to be a sonar circuit for tracks, to detect obstacles going reverse. The labels are similar so it seems to be confirmed that is a circuit from Fuso tracks. The analog board with adjusted coils should be the analog oscillator and detections circuits. Forgot all that I’ve said. is not from a truck. It is a fish finder sonar. Then I go for a fish finder sonar. I’ve seen something like that, but I do not know what it’s about, I was curious to know what it is. Hello Andrew, I know you’re a busy guy, I do not intend to waster your time, I need some guiding, mentorship on electronic product development, I have read and listened to some of your works and I am drawn to you for your support for an open approach to hardware development. I would like to layout my idea(s) and have you advice on approach and reporting procedures please. I hope you’ll consider my submission, thank you. I think mangel is on the right track with it being a fish finder sonar. It would mean that the manufacturer is actually Fuso Electronics Co. (https://www.fusoele.com/) instead of Mitsubishi Fuso like everyone (including myself) assume when they see the board. It’s totally reasonable considering the approximate date of the board (~1985) for it to be a Fuso Marine Finder or other early Fuso fish finder (Fuso-403?). It’s not too surprising for there to be Mitsubishi ICs here but the Mitsubishi ROM makes it seem more like an actual Mitsubishi Fuso board. If it is actually a fish finder, it could explain a few things. A fish finder needs sensors for both the temperature of the water and the speed of the boat to calculate accurate depth–which explains the ‘SPEED’ and ‘TEMP’ pots. The designated ‘KEY’ pins on the micro are for the input buttons on the front panel. This really makes me think it’s a fish finder because no car is going to have user input for its sonar system. Also, there is significant water damage throughout board 1 which is probably from water spray. The discrete logic ICs making up the upper half of the board seem to be outputting an 8-bit value to be displayed. Coincidentally the marine finder 1000 has a range of 256 m :). The bottom left of the board is for the transducer and has a multivibrator for adjustable pulse length (shallow vs deep water). The adjustable coils on the second board along with power management suggests that it is the analog front-end and power supply for the transducer. The second board looks very similar to the board in a tiny inkjet printer that I have. But, I don’t see any motor drivers etc., and there’s a quad comparator on the left-hand side, so yeah, probably a fair bit of analog stuff going on.